Today’s office space isn’t the same as 100 years ago. Yes, people sit in a big office or in isolated spaces but because of changes in technologies and so on, the way office space is applied is changing to meet the challenges of the new era of the work environment. Office space today has to accommodate the new age of computing. In the old days, people used to be crowded into an office like cattle. They would sit should to shoulder and hammer out their duties day in and day out. Alterations due to technology changed everything. Before phones, offices were laid out one way, when phones came into play, office changed. With new office equipment that was large or needed more space for these electronic devices, more space was required and seating had to be in adjustment to this. As new materials and design came into play, office furniture changed as well. It was about making workers somewhat comfortable as well as clients and senior management. New materials for comfort, new designs for movement and efficiency have all played a part. Using scientific data gathered, office furniture has turned into more an issue of making sure that workers achieve the best productivity and efficiency there is. Ergonomic furniture and tools and equipment have all come into the work space over the past 20 years as well a psychological placement. Office design is important in this respect. Workers who need to focus on computer screens may or not need big windows to keep from feeling closed in and disoriented. Some office furniture is translucent, some are lightweight, others are traditional made of quality materials like oak, pine, and others. Some offices have rugs, even throw rugs to spice up the appearance and paintings and photos on the wall. 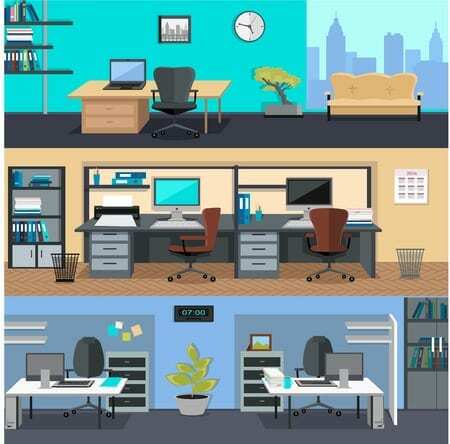 All these come into great ways of office organization that makes for a pleasant work environment. A pleasant work environment means greater production and efficiency. If you want to see what’s going on with today’s office space and office furniture, take a trip to your city if possible, and just stop by some of the office buildings and take a quick look around. You may find some offices that look like palaces while others look like bunkers in WWII waiting for the Axis powers to attack. You’ll see some offices with so much art on the walls they look like museums, while some offices have bare walls, sometimes just cinder block or concrete. A well designed office meets the basics first and aesthetics later. An office isn’t a but it is a social meeting area for clients and staff. It has to be laid out so that people aren’t bumping into one another and other nonsense. If you find an office that is well laid out, just compliment them and ask who the genius is who laid it out. Those tips can be valuable to you. You may also score some tips on where to get discount office furniture and supplies as well as references to furniture installers. This is money well saved and money well spent. Who knows what the future will hold for the new age of office space and office furniture. With constant breakthroughs in digital technologies, 3D holography, the office of tomorrow may look totally different of that of today and you had better be ready for it.